My mother did not want it said that she died peacefully. True, she was in her home, surrounded by the people and things she loved. But despite the fact that she had no fear of making the transition out of her earthly, physical form, she fought willfully for more time here, mainly to be with me, her only child. In life, however, she was a peacemaker, helping dissenting parties to focus on common ground long enough to realize the folly of their conflict. She was a teacher, a student, a leader, a speaker, a writer, a decorator, an accountant, a musician, a nature enthusiast, an animal lover, a baseball fan, a fashion maven (she could tell you exactly what she wore at every important event of her life) – and a spirited woman who wholeheartedly supported her family and partners, while paradoxically remaining staunchly independent. The third of four daughters born to a farming couple in Clark County in 1931, Mom gleaned her sense of fashion from her father, who wanted his girls stylishly clad, even during the Depression. If growing up with few possessions created in the sisters a penchant for the finer things, they were nonetheless well aware that spirituality trumped materialism every time. Losing her mother at age 16 must have contributed to Ruthe’s early individualism and maturity. Georgetown College student Ross Figart was the visiting youth minister at Carlisle Baptist Church the summer of 1948 and he couldn’t help but become fascinated with the most beautiful and interesting girl in the choir. Some of her favorite memories are of staying in the original Rucker Hall at Georgetown during their courtship. They were married in 1950. My parents had been pastoring the county seat church in Vanceburg, Kentucky, for seven years when I arrived in 1964; Mom nearly died having me and doctors cautioned, “Don’t try this again.” Not one to gravitate toward anyone else’s children, she loved her only child fiercely and spared no energy in teaching me her spiritual values, her thirst for great literature and music, and her love of all creation, especially birds and cats. My earliest memories are of her scrubbing coal dust off of me and off our black and white tomcat in Hazard, Kentucky, where she would emerge from our tiny mountain parsonage ready for church looking like a combination of Donna Reed and Jackie Onassis. Throughout my life, I’ve been told by Kentuckians of all ages how much my parents influenced their spiritual development. During my dad’s 13 years as director of missions for Boone’s Creek Association, and his 11 years as director of missions for the Kentucky Baptist Convention, I watched my mom live her roles of “preacher’s wife” and “missionary’s wife” to their fullest – from the slate-rock hills of Eastern Kentucky to the jagged coastline of Brazil, South America. She had a gift for helping others to reach their potential, whatever the field of interest. Growing up in the idyllic setting of Boone’s Creek Camp, I tagged along as Mom led campers on nature hikes and bird walks through the wooded hillsides. I watched her transform the tiny timid Corinth Church choir into a forceful ensemble that could deliver a cantata to rival those she’d been a part of during music weeks at Ridgecrest Conference Center in North Carolina. Sometimes we’d arrive at a church where Dad was slated to interim preach, and when no one came forth to play the piano, Mom would matter-of-factly assume the bench, unrehearsed and unruffled. Any time I heard her speak publically – from small circle gatherings to state WMU conventions – she always made herself vulnerable to her audience by sharing a moving anecdote or reciting a powerful verse that would inevitably bring my highly emotional “Mom Bit” to tears. But this caused others to respond on a far deeper level than would have been possible if she had refrained from crying. After my dad died in 1992, Mom finally had her own college experience when she majored in English at the University of Kentucky in her mid 60s. She won awards for her writing, as her daughter had done decades earlier – not surprising since my communications talents were obviously inherited from her. 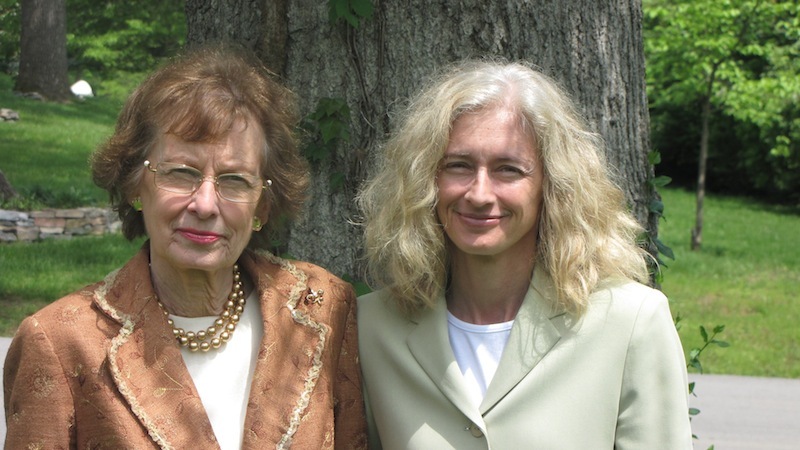 She won an entire piano once for writing in 100 words, “Why I love my Baldwin.” Never forgetting her Georgetown connection, she supported the school whenever possible as a way of honoring my dad. When Mom fell in love with Bill Sphar in 1999, she cycled back to the farm life she had left behind in childhood. After five years of traveling and enjoying Spring Hill together, he became ill and she managed his daily care for two years. In the stressful throes of caregiving, she accidently ran over her own dear cat, Louisa, and a part of her soul never recovered from this trauma. Her strength and determination made Bill’s final transition a comfortable one. When she left the farm, she took with her his faithful hound, Bebe, and gave her a life of luxury until her death this past January. 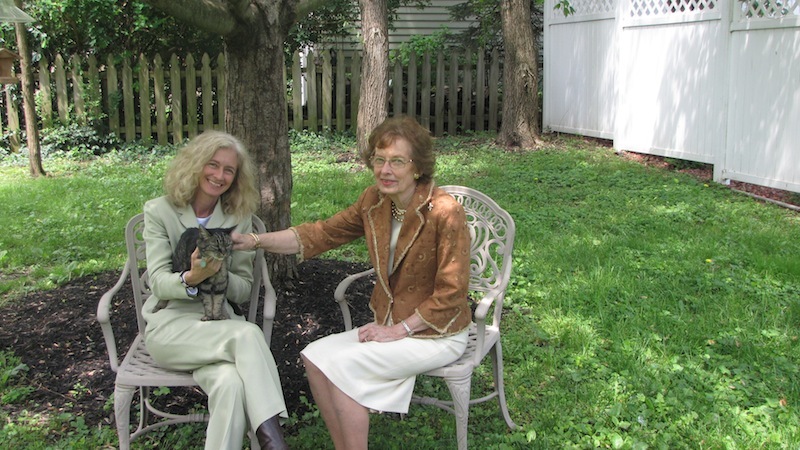 When Mom could no longer continue teaching her beloved adult Sunday School class at FBC, she turned her creative energies to writing a memoir of her bucolic childhood, “A Feast for Charlie,” which was published earlier this year. About the same time, God sent Paula Underwood Rhodus – who was born and raised in Vanceburg a decade after we left – to help me care for my mother. Every day Paula came, Ruthe taught her something new – about birds, about flowers, about language, about music, and about life. Paula gave Mom a new connection to one of her favorite communities and provided an opportunity for her to continue to teach at home. 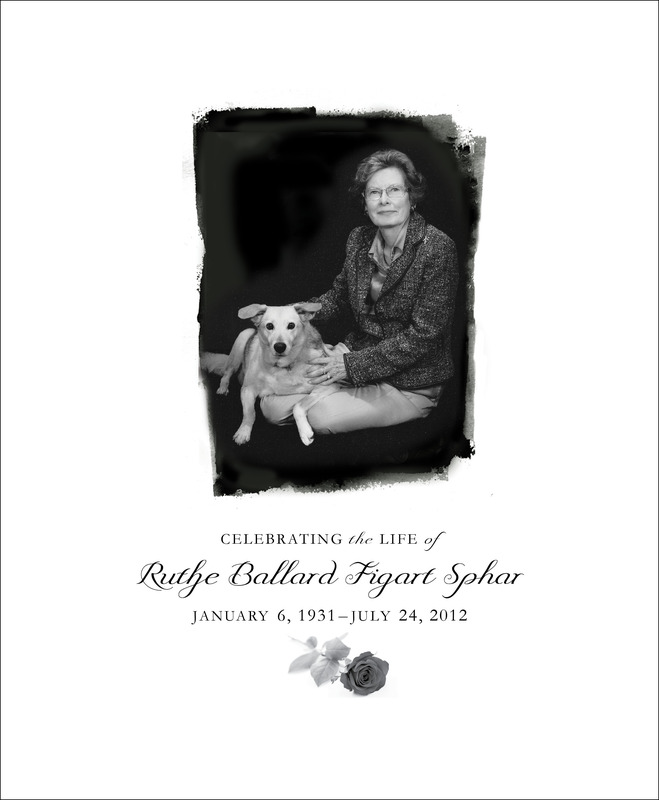 Ruthe never lost her sharp mind, offbeat sense of humor or “the-show-must-go-on” poise. Whenever she became bored with crossword puzzles and Neiman Marcus catalogs, Mom would gaze resolutely at me or Paula and say, “Let’s roll.” We’d get her into the small transport chair and she would pedal along as we rolled around the house–first to the screened-in back porch to see her squirrels, rabbits, finches, woodpeckers, hummingbirds, cardinals, wrens and blue jays; her roses, crape myrtles, hydrangeas, herbs and tomatoes on the vine. Next she’d visit favorite books in the library, gleefully wake the cats from their naps, watch fervently from the front door as we went to retrieve her abundant mail, and sometimes she would play hymns on her piano, as she always had, by ear. 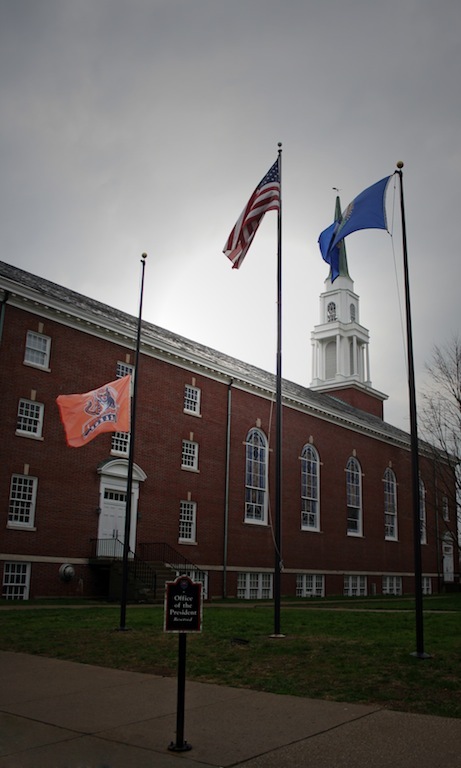 The Georgetown College flag was lowered to half-staff for two days after Ruthe’s passing to honor her inimitable spirit. Her ashes will be scattered in Vanceburg’s Kinniconick Creek. We will all miss her grace, humor, insight and unconditional love.